I love this soup. With spring ending in the next month or so, I know it’s a little late to be writing about hot soups (cold soups coming soon!) but this unseasonable cold snap we’ve had here in NYC, inspired me. The original title of this recipe from “The Art of Good Cooking” was just “Cabbage Soup,” which doesn’t sound very appealing. After brief review of the ingredients, I realized that with just a few tweaks, this could easily be a deconstructed stuffed cabbage soup. 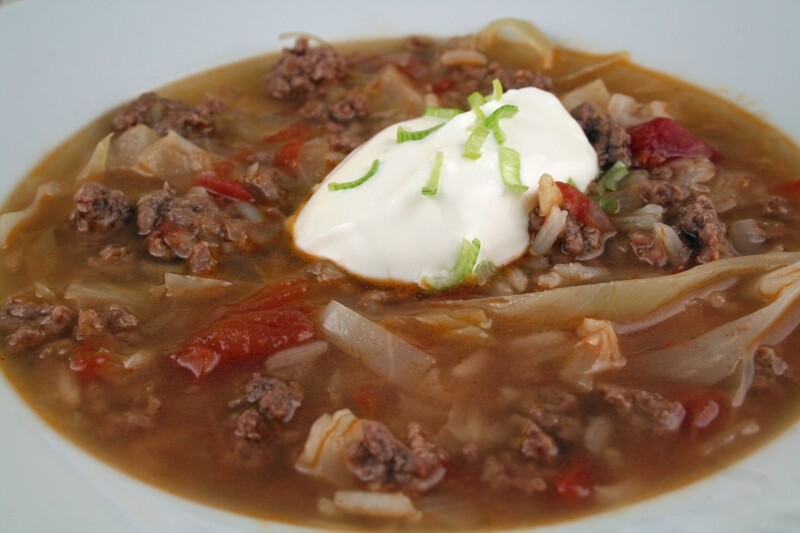 Change the beef brisket to ground beef (cheaper and easier), add rice, and this is one delicious soup. 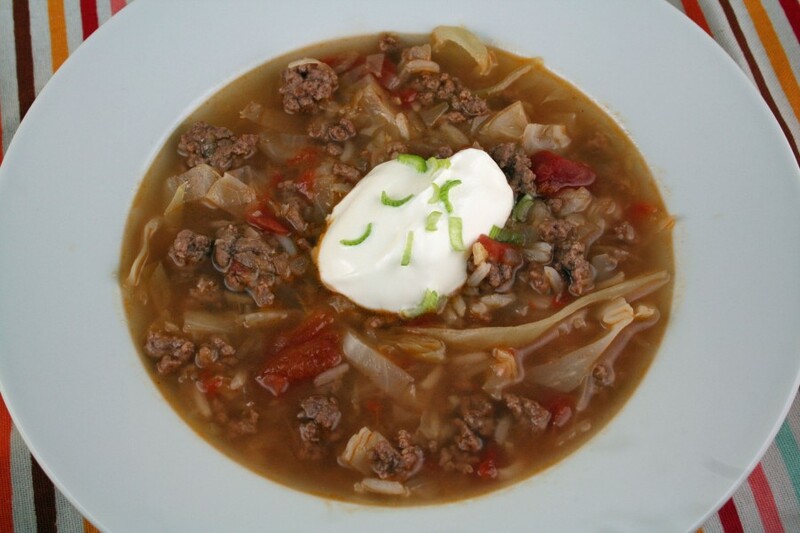 If you don’t like cabbage, you will still like this soup and you’ll be surprised at how unrecognizable the cabbage is. However, if you don’t like sauerkraut, you may not have as much luck. It adds a subtle pickled tang in the background that I personally love. Maybe I’m biased because at one point in my life I liked stuffed cabbage so much I bought the Lean Cuisine version regularly (sad but true). However, as a quick one pot weeknight meal that’s fairly healthy, this has become one of my favorite soups. Heat a deep soup pot over medium heat. Add about a tablespoon of oil. Add ground beef and brown, breaking up the meat into smaller pieces, about 3-4 minutes. Remove meat from heat and set aside. Drain all but about a tablespoon of fat from the soup pot. Heat over medium and add onion and garlic. Saute until onions are almost translucent. Add shredded cabbage, sauerkraut, some salt, and pepper. Saute another 3-4 minutes to soften. Add stock and tomatoes. Bring to a boil and add rice. Reduce to a simmer and cook until rice is just barely softened. If using cornstarch, stir a half cup liquid from soup pot into cornstarch. Then stir mixture back into soup. Add lemon juice. Megan, my family loves this soup so much that we almost eat it weekly. Thank you! The only minor tweaks I made to suit my family’s tastes are: –adding a few dashes of Worcestershire sauce when sauteing the beef; we liked it a bit more “tomato-y” so we added a tablespoon of tomato paste; we cooked the rice separately so it wouldn’t disintegrate in the soup; I noticed the soup didn’t get to the full flavor I was seeking until about two hours of simmering; used chopped fresh dill for garnish. Thanks Pat! Those are great tips. I’ll have to try adding the tomato paste and dill for sure. I actually like this soup better the next day, the longer it sits (or simmers), the more flavor!